During Super Bowl Sunday, much to the dismay of viewers watching the biggest game of the year, Chris Collinsworth was seated alongside Al Michaels to call the Eagles-Patriots showdown. If paid any attention to the way Collinsworth called the game, he sort of made it seem like he had money riding on the Pats. Collinsworth seemingly wanted the Patriots to win the game, and his tone gave it away during several crucial calls in the contest, including Zach Ertz’s controversial TD, which seemed to upset him because it wasn’t reversed like he thought it would be. 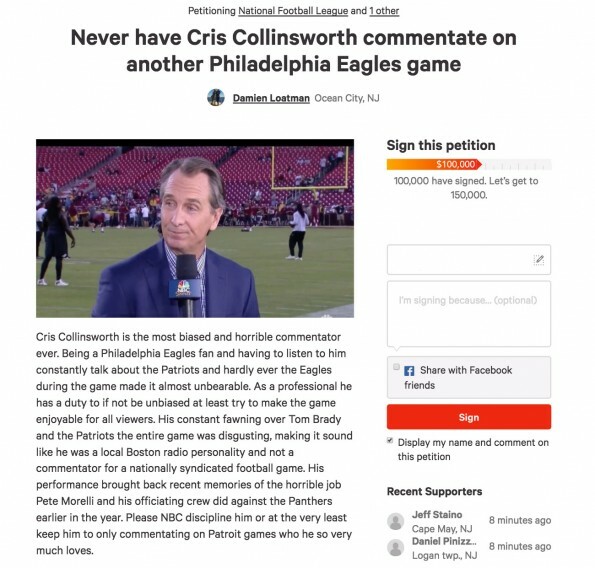 For that reason, Eagles fan want the longtime broadcaster to never call their games again. They even took to Change.org to make sure it doesn’t happen.